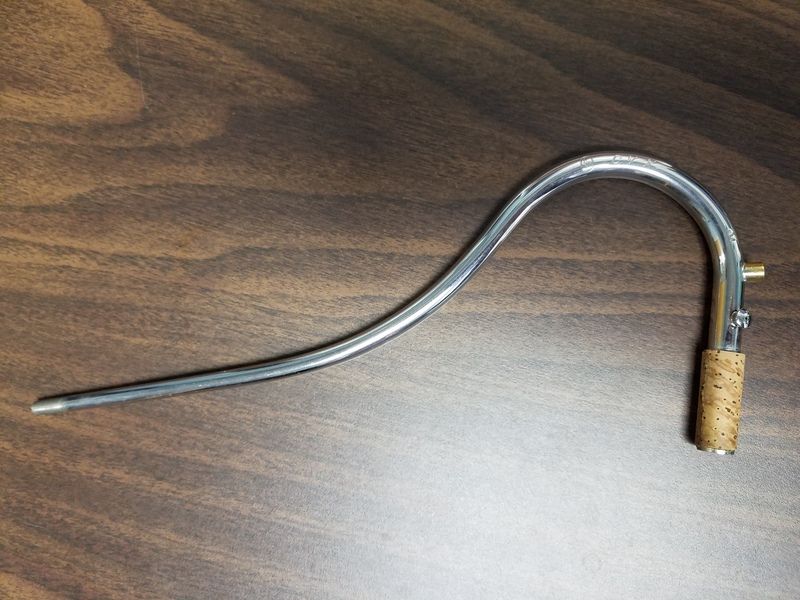 Be sure to check out my recent interview with Trent Jacobs, the inventor of the Little-Jake bassoon/woodwind pickup. A bocal that you’re willing to have altered. I had an old one that I liked but wasn’t using much. The bocal needs a small hole drilled in it and an adapter soldered to it. A skilled instrument technician can probably make you an adapter from scratch, or you can buy one pre-made. Forrests Music has one, and so does Midwest Musical Imports. I bought Forrests’s (cheaper) version, plus the threaded plug in case I want to use the bocal without the Little-Jake. I shipped my bocal to Forrests and they installed the adapter for a very reasonable fee. The Little-Jake pickup. It’s a thin cable with a 1/4″ plug on one end, and a little threaded connector on the other. The threaded end connects to the adapter on your bocal. A preamp. 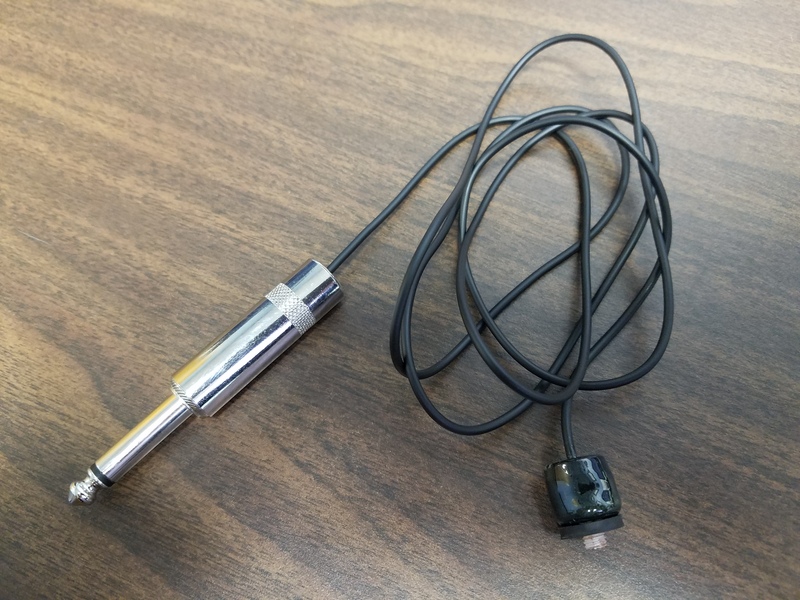 The 1/4″ end of the Little-Jake connects to the preamp’s input jack. The preamp works some electrical magic to get the electronic “signal” ready for amplification. 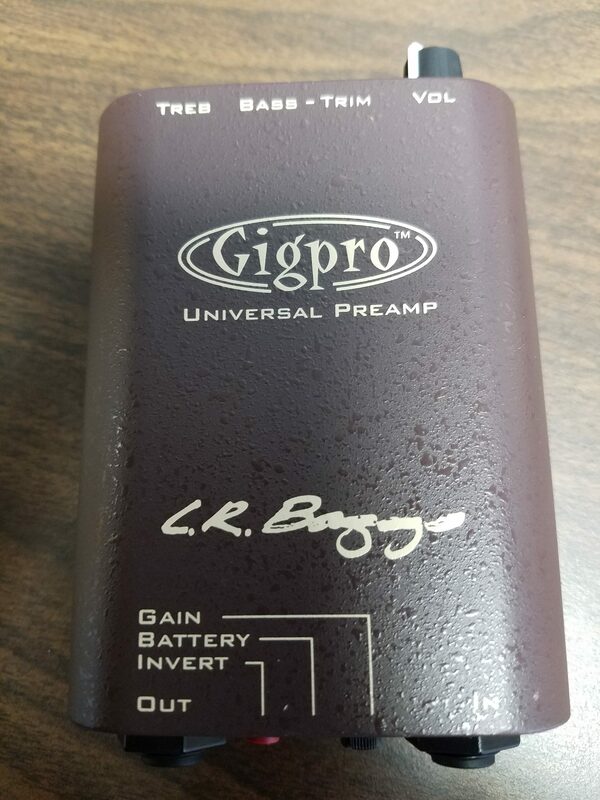 You can buy an inexpensive one made from an Altoids tin, or this L. R. Baggs one that Trent recommends, or there are other options if you know what you’re doing. The L. R. Baggs is handy because it clips to your belt and provides a volume control. An audio cable, like the ones used for electric guitars. One end plugs into your preamp’s output jack. An amplifier. The other end of the audio cable plugs into an input jack on the amplifier. There are many options at many price points. I use a small Mackie PA system for practicing or small venues, or a keyboard amplifier if I need more volume. Keyboard amps and PA systems are usually designed for a relatively “clean,” unaltered sound, whereas guitar amps tend to add their own character. This is a personal choice depending on what you want to sound like, but for me the keyboard/PA-type amp seemed to make sense as a starting point. 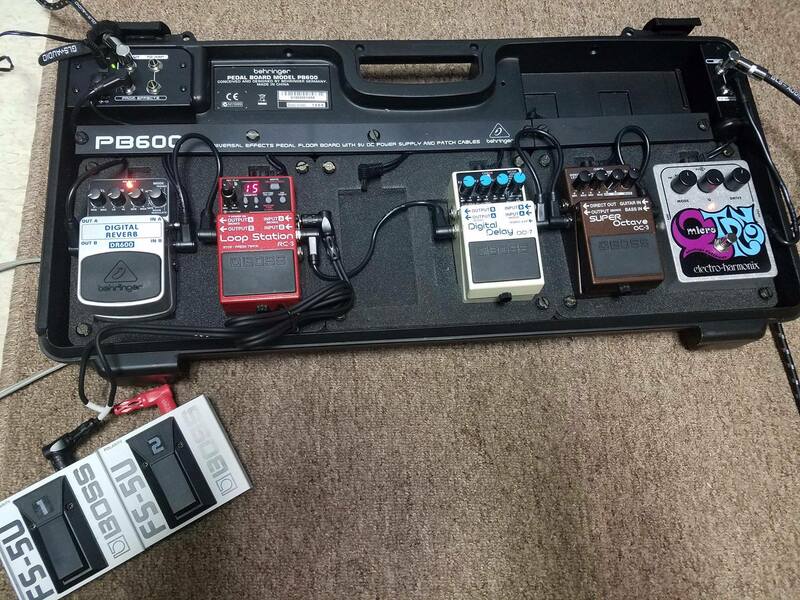 That’s enough to start making some fun sounds, but refer to Trent’s interview and an article on his website for some thoughts on adding effects pedals, which really make things interesting. 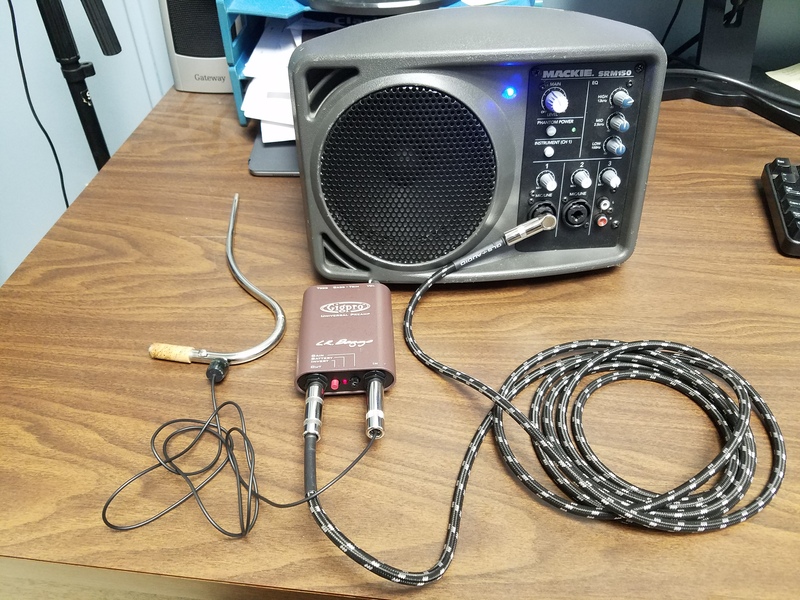 The Little-Jake can be used for some other instruments, as well, with the same setup (except the adapter must be attached to a saxophone or bass clarinet neck, clarinet barrel, etc.). Last summer I finally got myself a Little-Jake setup so I could experiment with some electric bassoon playing. 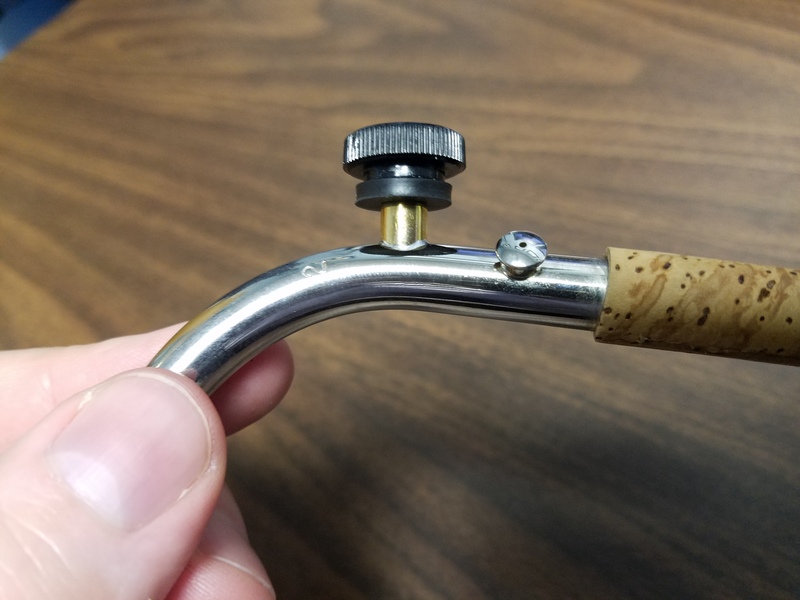 The inventor of the Little-Jake, Trent Jacobs, is a performer, educator, and reedmaker, and I’ve linked to his blog posts on a number of occasions. Trent was kind enough to answer a few questions about himself and about the Little-Jake. Tell us in a nutshell about yourself and your career. I have a bachelor of music degree from the Lawrence University Conservatory of Music, and Masters and DMA degrees from the University of Illinois. My primary teachers were Monte Perkins and Timothy McGovern. I moved to Minneapolis in 2009 where I started work at Midwest Musical Imports, and began freelancing and teaching as much as I could around the full time job. In about 2010 I started making reeds commercially under the Weasel Reeds brand, which grew significantly over the years. I started teaching bassoon and music theory at the University of Wisconsin–Eau Claire in fall of 2015 and left MMI shortly after. I now teach there and in my studio in Minneapolis, continue with the reed making business, help in raising my two children (which includes Suzuki violin lessons), and freelance when I’m able. In about 2005 while I was working on my DMA, I started working out that my thesis/project would be somehow related to jazz bassoon. Years prior I was a pretty competent jazz guitarist, but didn’t ever translate that to bassoon much, and never improvised on bassoon until then. So when pursuing jazz bassoon in all facets I encountered (again) the music of Paul Hanson, and his electric bassoon playing. If you know anything about Paul’s setup at that time, you’ll know he was using a pickup that was no longer being made or serviced by the inventor, and was an unusual piece of gear with odd technical requirements. The only thing on the market available to anyone else was actually a control booth earpiece that functioned as a microphone well enough when fit to a bocal (the Telex pickup). I was curious about it and happened to have a third-hand connection with Mark Ortwein at the time, and I knew he had a Telex setup which he let me borrow. It worked, but I was rather unimpressed with the sound quality I could get through my guitar amp and pedals, so I set out to make something I liked better. Quite a few dozen experimental pieces later I had a prototype I was close to happy with, that worked with the Telex fitting. What kind of background or skills did you have that made it possible? It’s rather embarrassing to say, but the first skill needed in making something like this is soldering, which I learned by modifying gaming consoles to play homebrew software. I had learned to do that with some tutorial videos on the internet and had made a few small electronics projects so I had some idea what I was doing. I also got some help from the guy that makes the Altoids box preamps that are now commonly bundled with the Little Jake in the technical aspects of circuit building. Most of the construction of them isn’t all that different from bassoon reed making in my mind. Small pieces have to be fit together in a precise way, it’s just that the tools and pieces are a bit different. The hardest thing in the early days was getting a good connection with the existing Telex pickup bocal adapter being made by Forrests Music. I was fortunate enough to have a colleague in the bassoon studio at the University of Illinois who was an architecture major and had access to CAD and acrylic laser cutting machines. He helped me prototype and get working pieces to allow for a solid connection. Eventually I switched everything over to a threaded/screw adapter like what Paul Hanson was using with his FRAP pickups, so he could use my pickups with his existing equipment. That is the only way I make the pickups now. What instruments are people using the Little Jake with? Are there others that it theoretically would work with? I’ve seen them used on clarinet and saxophone, although not too much. Nearly any woodwind instrument is possible, as long as the player is willing to drill a hole where it’s needed. Clarinet is best done in the barrel, which is easy. Saxophone could use the mouthpiece but the neck is better, similar to the bocal mount for the bassoon. English horn could be done on the bocal but it’s fine work and I don’t know of anyone that’s actually gone there. Flute is the one that’s not really necessary, as there are plenty of high quality microphone systems for flute that would be ultimately superior to the sound you could get with the Little Jake anyway, but there is a way to modify a Little Jake and a headjoint of a flute to make it work together. A lot of work and the sound wouldn’t be as good as a commercially available flute mic at the lip plate anyway. Oboe is the toughest sell: you have to drill a hole at about where the third octave key is on the top joint. Most oboists aren’t willing to sacrifice a top joint to electrify the oboe, so I don’t think it’s been done. Paul McCandless has done it in the past with a FRAP, but I don’t think anyone else ever has. I’m sure there are non-western instruments that it’d work with as well, as long as there’s a place to drill the hole. Have you seen any uses of the Little Jake that you found especially surprising? I’m just always surprised when I find a bassoonist using it and enjoying it in a rock band setting. I’ve had people send me recordings over the years and it’s pretty cool to see something you’ve created being used in contexts you wouldn’t yourself be in. I was blown away when I discovered a band in Iceland that had a bassoonist using a Little Jake. Obviously using a Little Jake opens up a whole rabbit hole of new gear to buy, but what is a good minimum setup that, say, a bassoonist needs just to try out some electric playing? The amp is the most important second piece of equipment. The goal of using a pickup with a bassoon is to get the sound space into a place that can be heard even when there are drums involved. When putting together a guitar rig, as an example, the guitar is only half of the sound; the other half of the sound is the amplifier. Ask any guitar player, the amp is absolutely critical when getting the tone you want. All the pedals and stuff you can put between the instrument and amp are just extras. So it’s really important to get an amp that gets you the sound you want at a volume appropriate for what you’re doing. I’ve settled on a really high end acoustic guitar amp, but in the past I’ve used bass guitar amps, powered PA speakers, and guitar amplifiers. It all depends on what kind of sound you want. You can get a good amp used for $100 or less. For someone who already has that minimum setup, what are the next few things to consider buying? If you don’t know anything about effects pedals, one of the simple and small multi-effect units for guitar or bass guitar are a good starting point. You can experiment with lots of different types of effects and decide what you like to use before investing in more specialized gear. Those multi-effect units can sometimes be found for $50 if you get a good Craigslist deal. If you know what kinds of effects you like, you can get dedicated pedals that do that one thing really well. I find that a lot of things respond differently to bassoon than to electric guitar (which is what these things are designed for) so you really have to try things out before you spend the money. It’s always fun to take your bassoon out in a guitar store and start playing through pedals. The people in those shops love it! I also really highly suggest effects units designed with vocalists in mind. A voice or wind instrument is more similar to a bassoon than an electric guitar is. I personally use a lot of pitch shifting effects, modulation effects (phaser, chorus, etc. ), and time based effects like delay/echo and reverb. I don’t really use distortion all that much unless I’m really trying to sound like another guitar player in the same band. The other thing that’s always sure to turn heads is an Envelope Filter (sometimes called auto-wah but that’s not really correct). That’s the effect that makes your instrument have that “quack” or “wah” sound when you articulate. What surprises or challenges do people run into when electrifying their instruments for the first time? Feedback is probably the biggest issue with amplifying an acoustic instrument. Feedback is where the sound from the amplifier or speaker is picked up by the microphone, which creates an audio loop that quickly becomes very loud and usually very high pitched. Acoustic instruments have more problems with this because they themselves are a bit of an amplifying chamber that can pick up the sound of the speakers. You have to learn what effects and volume levels will create that feedback with your own setups and be ready with a plan to control them (be always close to a volume knob that you can zero out if it gets really bad). Do you have any favorite bassoon- (or woodwind-) playing tips? Don’t play on crap reeds. Life is too short. Practice your damned scales and long tones. Take good care of your equipment: regular instrument maintenance with a specialist on that instrument, store things properly, clean them regularly, buy appropriate cases or covers or whatever to keep things protected. Don’t swing stuff around carelessly. Swab your horn. Especially in my years at MMI I was frequently amazed at how poorly some people, even professionals, took care of their gear. If you’re playing a bassoon at a night club you’d best know that you have the single most expensive piece of equipment in the band probably, and nobody knows it or cares, so watch out for your own stuff. Would you like to share anything about your recent medical history? In May of 2017 I was diagnosed with esophageal cancer. I underwent 9 weeks of chemotherapy and in early November had surgery to remove the tumor, which involved also removing my entire stomach and a portion of my esophagus. I finished 9 more weeks of chemotherapy after the surgery and have started playing again, but I still have a long road to recovery and learning to live without a stomach. I have started teaching and working again and so far things are looking good for my healing. We will do regular scans and hopefully find nothing. I found that some side effects of chemo prevented me from making reeds as much as I was used to, and generally being fatigued kept me from playing as much as I wanted. I obviously had to turn down quite a few calls for gigs. I’m fortunate to have a good health insurance plan through my university and have some of the best doctors in the world working on me, so while my income has suffered I have a good safety net. I expect to be in full production of bassoon reeds again in the spring of 2018, so if anyone wants to be notified when I have reeds ready to go again, send a message to me through my website.